Ford Racing offers the Factory Stock Ford emblems and plaques for your car or truck. If you want to do a restoration or show off an engine swap on your vehicle, this is the perfect way to advertise what is under the hood. The emblems are made from injected molded plastic with a chrome finish and the plaques are a blue inlay brushed over an aluminum plate. 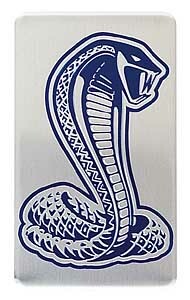 The Cobra Jet grille emblem is inspired by the Ford Racing Cobra Jet Mustang and is laser cut metal. Does Ford Performance M-1447-D46 fit your vehicle?